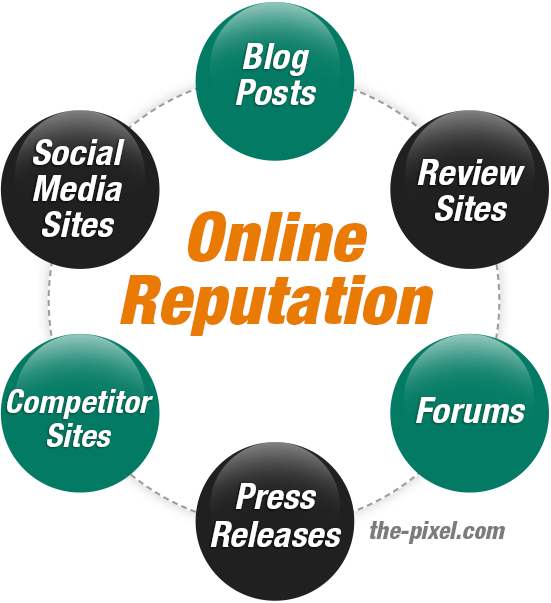 Building a long-term reputation has become an essential element of doing business online. In the face of the digital revolution, when you can successfully manage your business’ online reputation and social media presence, you can expand your growth and opportunity set. With an authentic and representative digital presence, your business can play to its strengths and capitalize on effective public relations. A good online reputation also impacts sales and profit for long run. Statistics also reveal that people trust online reviews: 90 percent of survey respondents claimed that positive online reviews influenced buying decisions. In comparison, 86 percent said buying decisions were influenced by negative online reviews. Building your company and brand reputation: Whether you are new company or are launching a new product/service or have branched out to a new industry or a customer base, your primary focus should be establishing a stellar reputation for your business and your brand. Maintaining your company and brand reputation: Maintaining your stellar reputation is critical. Once your company has established a solid reputation, you have to take continuous strategic and formational steps to maintain it. Recovering your company and brand reputation: A negative word or image in the public eye can ruin your brand’s reputation. To effectively address such an occurrence, your need to thoughtfully rebuild your brand overtime. Consider partners with expertise in how to create a strong positive image in the minds of the public. Positive association with your brand comes as a result of planned promotional activity and building trust. Sometimes not participating on social media can be a liability, especially when something goes wrong and there is a customer complaint. In other words, without an active social media presence, dissatisfied customers may be sharing their frustration. Responding quickly to a negative situation or accident is critical. If your team is not engaged, then your business cannot respond to issues and provide solutions. Business certainly don’t want to risk their credibility with their customers so by participating actively on various social media platforms like Facebook, Twitter, LinkedIn, Instagram, they can build a communicative network and a community of loyal customers who will be become their biggest brand ambassadors. Companies often step up their game by creating a separate support handles which would be dedicated solely to responding customers who need help. For example, Nike has a separate support handle @NikeSupport solely for this purpose. The customer service focused team behind the handle responds in minutes to an inquiry. This high level of engagement builds trust and loyalty. Another example is Starbucks, which created a handle for customers provide feedback and submit ideas for discussion. Naturally, @MyStarbucksIdea is less active than Starbucks main account, but having such a communication medium is a competitive advantage and differentiator, one that is hard to quantify from a monetary or branding standpoint. When starting out on social media, select one platform that is the most appropriate for your business. As you become familiar with social media, start integrating other social media tools. The most important thing to consider is which social network your target audience is accessing. LinkedIn for example, is an excellent platform for B2B professionals wishing to become an expert in a specific industry. Tools such as LinkedIn groups allow you to interact with people from specific professions, industries or interest areas by either starting, or responding to discussions. Creating a quality of good conversations and content will keep the audience engaged and it will also help to filter your website from other websites. Keep your audience engaged by posting consistently. Announce contest promotions and new service & product launches. Furthermore, engage with your customers, ask for their regular feedback, and communicate information that will help them view you as a resource when making the most informed decisions. In the end, Reputation Management is about being transparent with the public, which of course includes your current and future customers. Remember that the eyes of social media have forever changed the playing field for how companies create brand equity and communicate. This can be a material and long-term competitive advantage when you are purposeful and proactive.